September 05, 2018, 11:00 p.m.
With Ariana Grande’s recent single being entitled “God is a Woman” a new YouGov survey reveals that British Christians aren’t so sure about that: in fact, just 1% believe that God is female. The most common view is that God does not have a human gender at all, which 41% of Christians believe. The more traditional view that God is a man is held by just over one third (36%) of Christians. A further 3% believe that God has a different human gender identity to male/female, while the remaining 19% say they don’t know. Perhaps ironically, female Christians are more likely to believe God is male than Christian men are. Four in ten female Christians (41%) believe that God is female compared to 30% of male Christians. Roughly equal proportions of male and female Christians say that God has no human gender (42% and 39%, respectively). There is also a noticeable different between Protestants and Catholics, with Catholics being the most likely group to say that God is male. Approaching half of Catholics (47%) say that God is a man, compared to 33% of Protestants. 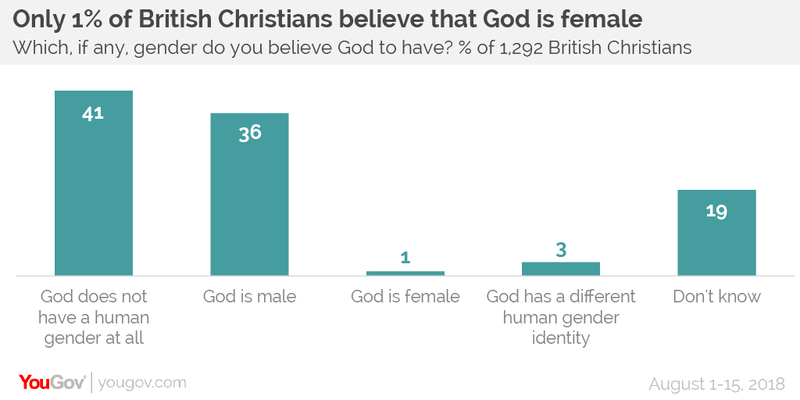 Mirroring this, 43% of Protestants believe God has no human gender, compared to 30% of Catholics. This too is perhaps ironic, as The Catechism of the Catholic Church #239, as laid down by Pope John Paul II in 1992, specifically states that "God is neither man nor woman: he is God”. 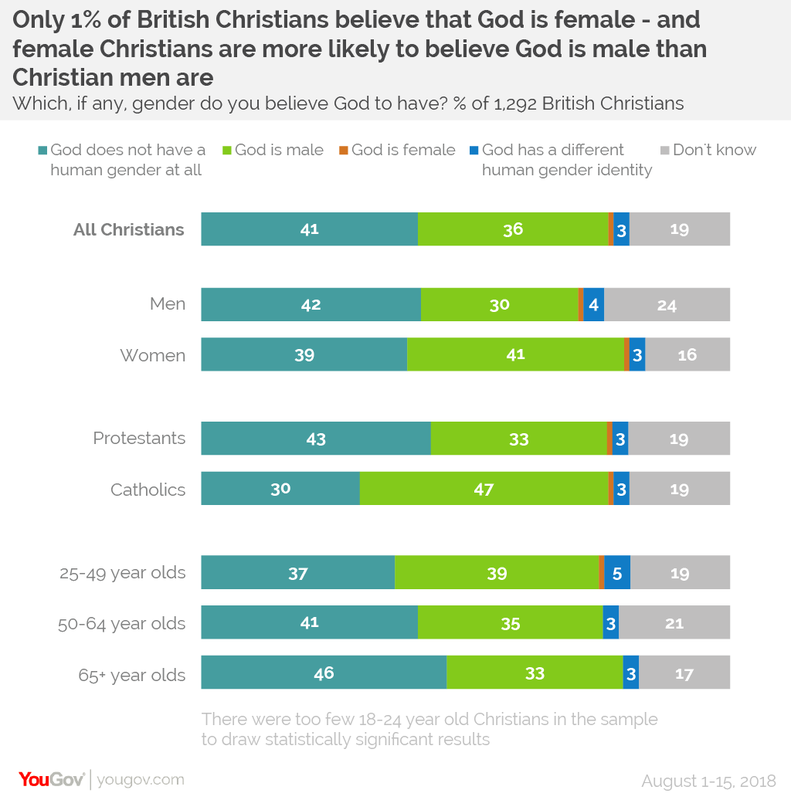 The vast majority of British Protestants follow the Church of England, which seems to still consider God to be male, although a movement within the Church called for God to be referred to as female in 2015. Other, smaller, Protestant denominations, such as Methodists and the United Reform Church, have previously introduced more gender-inclusive language for God. Age is another indicator, with older Christians more likely to say that God has no human gender (46%, compared to 37% of those aged 25-49). This relationship holds true when accounting for whether or not the Christians are Protestant or Catholic.